American physician and pathologist; born at Louisville, Kentucky, March 25, 1863. He received the degree of doctor of medicine at the University of Louisville, and continued his studies at Johns Hopkins University and the universities of Strasburg and Prague. Flexner was formerly assistant professor of pathology at Johns Hopkins University, and is now (1903) professor of pathology at the University of Pennsylvania. He has recently been appointed head of the Rockefeller Institute of Preventive Medicine, New York. In 1900 he served as a member of the Johns Hopkins University Medical Commission to the Philippine Islands, and in 1901 as a member of the National Plague Commission. 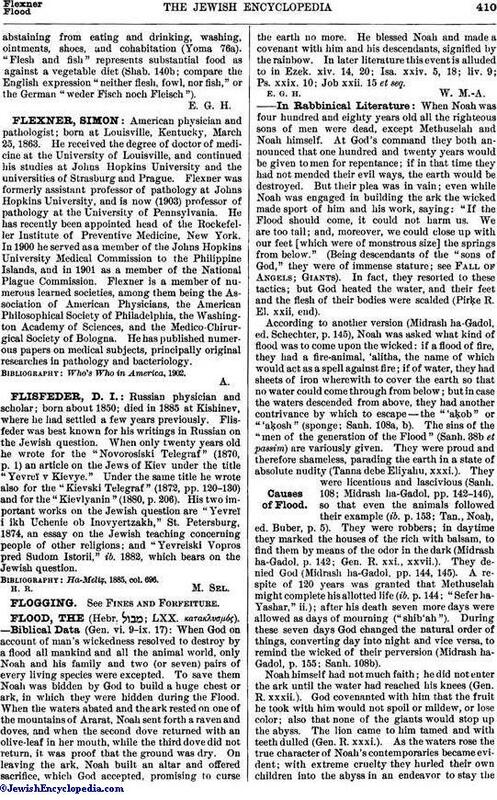 Flexner is a member of numerous learned societies, among them being the Association of American Physicians, the American Philosophical Society of Philadelphia, the Washington Academy of Sciences, and the Medico-Chirurgical Society of Bologna. He has published numerous papers on medical subjects, principally original researches in pathology and bacteriology. Who's Who in America, 1902.